Taranaki-based farrier, Andrew (Jock) Good has been shoeing horses of all ages, shapes and sizes for over 39 years. However, it hasn’t just been 39 years of nailing shoes on feet day in day out, for the man known by his friends and family as Jock. From bull riding to training Group One winning racehorses, Jock’s done all sorts of incredible things alongside his farriery career. We caught up with this well-known personality in the farrier industry and recently appointed president of the New Zealand Farrier’s Association to find out his story. Jock’s been shoeing horses for 39 years, but has no plans to give it up any time soon. Jock’s involvement with horses goes back much further than the 39 years he’s worked as a farrier. Growing up on a dairy farm in Hunterville, with a jockey turned sharemilker father, Jock was first introduced to horses at age five, when his father arrived home with a two-year-old unbroken pony called Gypsy in the back of his car. After his father had done the breaking in, Jock learnt to ride on Gypsy, sharing the pony with his two younger brothers and younger sister. The only one of the siblings to show a strong interest, Jock progressed to Pony Club and competitive show jumping and eventing. Given his involvement and love of horses, a farriery apprenticeship seemed the most suitable path when the time came for him to leave school and take up a trade. Jock’s parents had relocated to Taranaki from Hunterville during his childhood, and the farrier’s apprenticeship he ended up taking was with Graham Jones in the small town of Pio Pio, a couple of hours drive north of Taranaki. At the end of his 3 and ½ year apprenticeship, Jock didn’t go straight to full time shoeing, instead taking on a daring new sport. However, at 21, a great opportunity came knocking when Jock was offered the chance to take over Graham’s business on his retirement. He packed in the rodeo and moved back to Pio Pio. Back in New Zealand King Country, running Graham’s business, most of his work was shoeing farm hacks, and when motorbikes started being used more in place of horses in 1985, Jock says there were less farm hacks around and business slowed down. Consequently, the following year Jock and his new wife Helen, who he had met as a teenager through horses and married in 1985, made the decision to go back to Taranaki for Jock to start a job with top racehorse trainer, John Wheeler. Jock holds a horse at John Wheeler’s stables where he worked in the late 80s and early 90s training racehorses. Jock had a hand in the career of several successful horses that were in the stable during that time, including Poetic Prince who won the Cox Plate in 1988 and Rough Habit who won 29 races and over $5 million in prize money in his career. In the years Jock worked in racing, he and Helen welcomed both of their children Shaun (30) and Kate (27) to the world and bought their family home and property in Inglewood, just South of New Plymouth, where they still live today. Despite having horsey parents, neither Shaun nor Kate were pony mad kids. “Kate rode occasionally, but never competitively, and I put Shaun on a pony I was breaking in when he was little, it went under a plum tree and swiped him off, he never rode again!” says Jock. Even though they’ve never needed the space to keep a pony, the little Inglewood lifestyle block that Jock and Helen bought 27 years ago has been the perfect base for Jock to run his business from, something he focused on full time after finishing up with the race horses in the mid 90s. On the road Good Farrier Services covers the entire Taranaki region. During his career, Jock’s not only shod thousands of horses, but also trained three apprentices who are now out on their own, with his fourth due to sit his final exam to become qualified late August. It’s a trade Jock would recommend to young people who are prepared to work hard, but he says it’s a tough industry to crack in to. 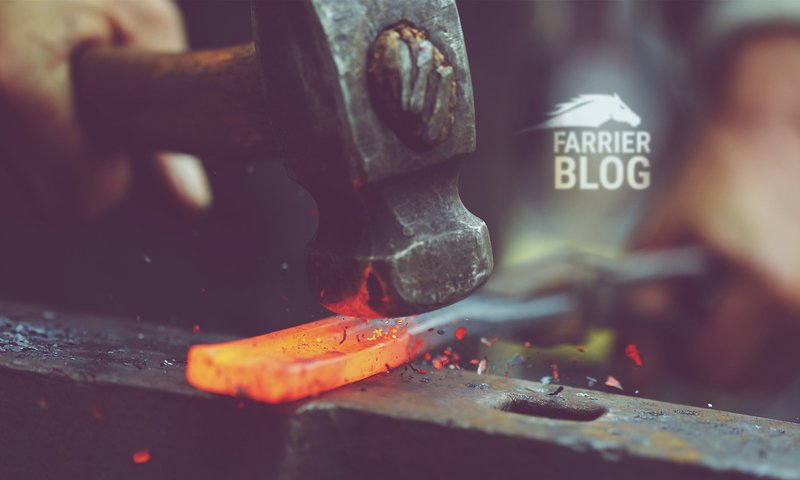 Having been recently elected as the president of the New Zealand Farrier’s Association (NZFA), one of his key objectives is to encourage more farriers to train apprentices. He’ll also work towards getting more people along to NZFA events to continue to promote knowledge sharing and keep improving the standard of farriery in New Zealand. Every farrier’s vehicle needs a hand held vacuum to keep it clean and tidy. At 55-years-old, with his current and quite possibly last apprentice approaching his final exam, the 40 year anniversary on his career looming, and a couple of grandchildren to keep him busy, Jock is slowing down a bit, but is far from talking retirement yet.